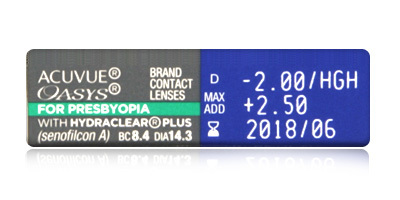 Fitting Fitting generally represents the Base Curve and Diameter of the lens in mm. Typical values range from 8.00 to 10.00 for Base curve and 13.00 to 14.5 for Diameter Power Often called 'sphere' or 'strength. Measured in diopters and always preceded by - (minus) or + (plus). Negative (-) powers are prescribed to help correct short sighted conditions. Positive (+) powers help to correct a long sighted condition Addition Also referred to as "reading" or "near" addition, this is the correction required for reading or close-up work. The figure is normally the same for both eyes and represented as a plus figure. Addition tends to be added to Bifocal or Multifocal prescriptions in order to accommodate all ranges of focus and correct Presbyopia. 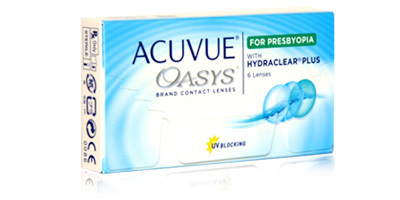 If you have difficulty focusing on fine print close up and reading signs in the distance then Acuvue Oasys for Presbyopia contact lenses can solve both problems.Why swap between two pairs of glasses constantly? One lens can do the job of both just as well. Recommended for those in their 40s and 50s, these multifocal contact lenses offer excellent acuity of vision in all conditions. Whether you’re in front of a computer screen or tablet device, in an air conditioned office, working out at the gym or driving at night, Acuvue Oasys for Presbyopia lenses will stand up to the task. 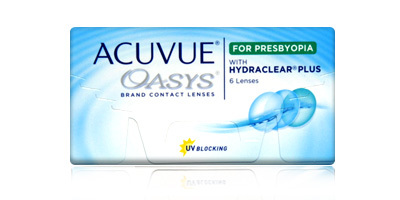 Acuvue Oasys for Presbyopia lenses offer better levels of UV-A and UV-B protection than most two weekly disposables. Johnson and Johnsons Hydraclear technology allows you to wear these contact lenses for longer than average periods without experiencing discomfort or blurred vision. Wear them on a daily disposable schedule for up to 14 days or on an extended wear basis for six nights on approval from your optician. Application is easy thanks to a light blue handling tint and inside-out indicator. Call 0330 088 3133 for advice on any of the products featured on lensite.co.uk. 98% of orders placed are shipped the same day. © 2017 www.lensite.co.uk. All Rights Reserved.